The leader of Vale of Glamorgan council has urged the Welsh Government to form a policy on shale gas exploration. Research suggests reserves comparable to those of North Sea gas may be stored in rocks deep underground south Wales. But concerns have been raised over the environmental effects of extraction - also known as fracking - amid fears of water contamination and earth tremors. The Welsh Government said it would welcome working with the UK government on a policy framework for shale gas. Fracking involves injecting sand and fluids into underground hard shale rocks to force them apart and release gas trapped inside. The process has caused controversy in the US, where some householders claim that shale gas leaking into their drinking supply causes tap water to ignite. In Lancashire, fracking began earlier this year. 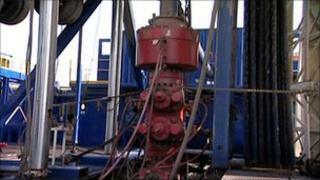 They are the first wells in western Europe dedicated to shale gas alone. We're looking at a regional issue for about six different Welsh counties - it is a matter the assembly should look at. But the operation has had to be put on hold over fears of a link to recent earth tremors in Blackpool. Research suggests shale gas worth up to £70bn may lie in the rocks deep below south Wales. Bridgend-based Coastal Oil and Gas has been granted planning permission for exploratory drilling north-west of Maesteg in the Vale of Glamorgan. But the applications are for drilling purely for sampling and testing in the lab. However, Louise Evans, of the Vale Says No campaign group said: "People are certainly worried about it. It's a very short-term fix with very long-term consequences. "The risks involved in this practice are huge. We're not calling for a halt. We're calling for a moratorium, for the (UK) government to undertake necessary environmental and economic impact studies so that they know what they are letting themselves in for." A cross-party group of MPs on the Energy and Climate Change Committee recently rejected safety concerns and recommended that drilling should be allowed in the UK. But there are concerns the planning system in Wales is not geared up to cope with a proposal on such a scale. Vale of Glamorgan council leader Gordon Kemp said: "This is a matter that should be looked at and possibly determined by the National Assembly. "The assembly issue advice on virtually every other planning matter, but there's nothing on this at the moment. "We're looking at a regional issue for about six different Welsh counties. It is a matter the assembly should look at." A spokesperson for Welsh Government said it would "welcome the UK government working with devolved administrations to put in place a policy framework for shale gas but the case for a moratorium rests with Westminster".